Last weekend my husband and I, along with a few of our great friends drove up to Los Olivos, a small town in Santa Ynez Valley near Santa Barbara, for a one night stay and some wine tasting. We had such a lovely time as the weather was perfect and the scenery was beautiful. We visited two wineries on Saturday, Rusack Vineyards and The Demetria Winery, both of which were really nice. They both offer great tasting but neither one offers any food. We had planned this ahead of time and knew this to be the case, so we all came up with a “pot luck picnic”. We all bought small coolers filled with cheeses, crackers, pate’, olives, fruits and nuts and even some Lindt chocolates and a table cloth! We enjoyed most of the wines and even bought a bottle or two to bring home from each winery. We finished off the day with a nice dinner in downtown Los Olivos. Sunday morning we all met for coffee in Los Olivos around 9.30am and then walked the main street. We all stopped in at the Olive Hill Farm shop for some Olive oil and balsamic vinegar tasting which was super fun and we all left with a couple of bottles of delicious olive oil as well as some great flavored balsamic vinegars. We choose a peach and a fig balsamic vinegar wheich were delicious and I can’t wait to use these in our daily salads. For our final stop on the way back to Los Angeles we stopped at Four Seasons “Biltmore” Santa Barbara for their famous Sunday brunch. The hotel grounds are beautiful and it is located right on the ocean front. It was a really nice way to finish off a short but super fun weekend trip with great friends. As for today’s look, I have a brand-new color to debut in our best-selling Cape Vests which I am calling Cinnamon. It is a beautiful color especially for fall. I also have a brand-new scarf that works perfectly with this Vest, our Cinnamon Blue Black Ethnic Print Scarf Shawl. The scarf has many pretty colors in it and one of the colors is a taupe/stone. 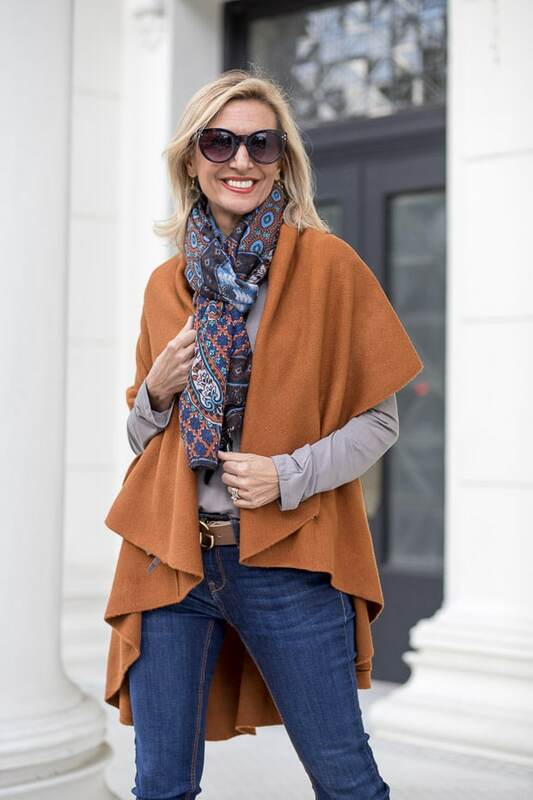 To pick up on this great neutral color, I styled the cape vest and the scarf with our brand-new Stone V Neck Long Sleeve Top. This top is the same rayon modal top which I have shown you before in ivory and camel. It has a beautiful hand and an easy body to wear. The length is long as well, please check the shop photos to see how it looks left out. As for jewelry, I added our Faux Horn Geometric Shapes Necklace and Earring Set which works really nicely with all the pieces. I wore all these pieces with my skinny jeans, cognac booties, belt and bag. All four pieces I am showing you today are part of our 24-HR Flash Sale where you can get 15% off with code FS19 plus Free US Shipping. All international shipments are a flat rate of $25.00. How do you like my look? Jacket Society was launched in the fall of 2013 by fashion designer Nora Minassian. Jacket Society is about Nora’s passion for classical and stylish easy to wear women’s fashionable jackets and blazers. 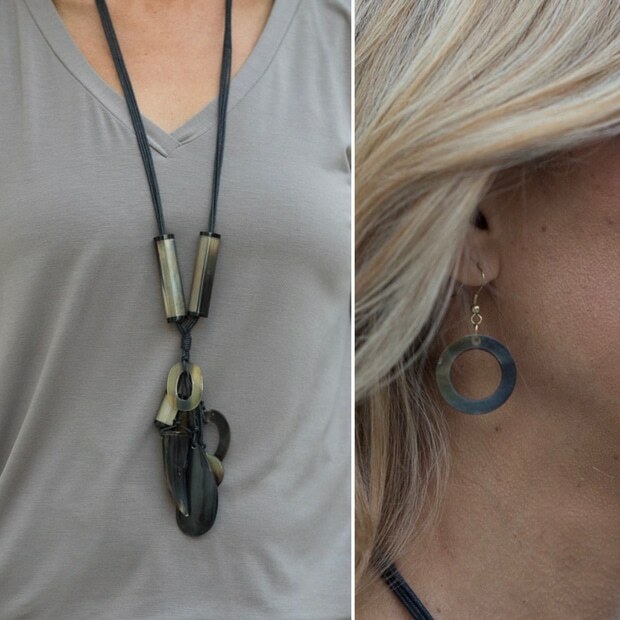 Nora earned her BA degree in fashion design and merchandising from Otis College of Arts & Design and has worked in the fashion industry for many years, travelling to the fashion capitals of the world to keep up with current fabric and style trends. Nora started this website and fashion blog to showcase and sell her favorite jacket styles that are all designed and manufactured in Los Angeles, California. On this site she will share her experience and knowledge of women’s fashion and present her unique sense of style by giving her fans and customers an opportunity to follow her jacket styling tips and secrets, emphasizing her favorite current and past classical jacket styles and be able to offer selection of her favorites for sale here on her Jacket Society website. Your weekend getaway sounds perfect! I love picnics are wineries! And I love your outfit! 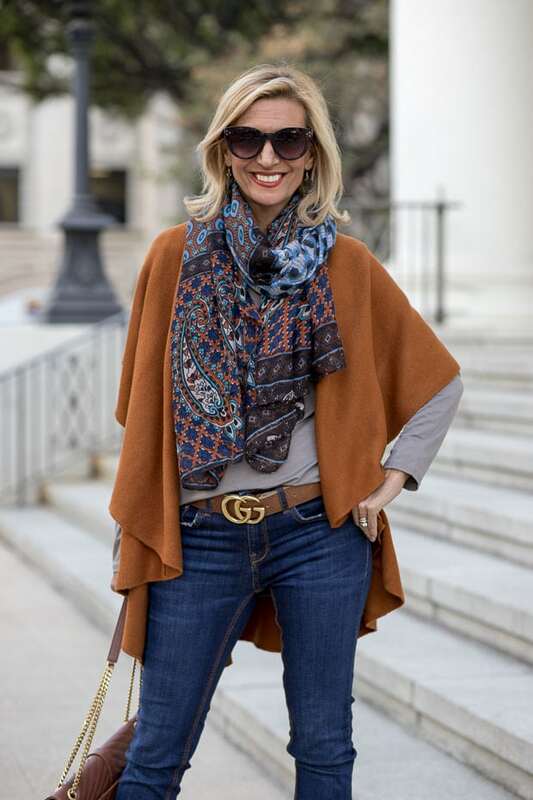 The cape vest is such a pretty color, and I absolutely love the scarf with it! It was the first time for us to do a picnic and wine tasting at the same time and it was so fun! Thank you so much for stopping by. Wow, your weekend sounds amazing! I am sure the wineries were a lot of fun and how clever to pack a picnic lunch in coolers. Yum! The olive oil and balsamic tasting sounds great, too… I am sure it will be delicious in your upcoming salads! 🙂 I just LOVE this cinnamon color, it just says Fall all over it! Yes it was a super fun trip 🙂 Thank you for stopping by. This vest looks SO comfy, and the color is absolutely perfect for fall. What a great piece! What a lovely weekend getaway! The potluck picnic sounds perfectly delicious. Your new cinnamon cape is just made for fall! I really like the warm color and beautiful draping.